We will meet you at the airport of Greece's "Northern Capital" - Thessaloniki. Our Pilgrimage trip stars with visiting Evia. There in some villages it seems to stop the time: traditions, customs, celebrations - almost indistinguishable from how it happened decades and centuries ago. 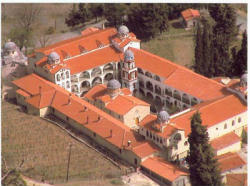 We will visit the monastery of Osios David situated in the heart of a dense area. In the church of the Monastery kept the fragrant and miraculous bones of St. David the Elder, the censer and stole of the Saint (Russian origin) and other precious relics. Also, around and outside the monastery you can visit many churches in memory of various saints. Do not forget to visit the hermitage of Saint David, covering walk a short distance to the cave where the hermit miraculous saint. Worth over from the basement chapel of St. Anargiron in the SE wing of the cells of the monastery, which gives you the opportunity to admire paintings of the 17th century. Then we will visit the church of St. John the Russian. John, he was born in Russia in 1690. John was a soldier in the army of Peter, and was captured by the Turks, after he fiercely resisted all efforts to end the Turkish officer let him free quiet to keep his faith. He became famous humility and miracles during his lifetime and after his death. 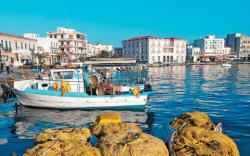 Arrive in the beautiful city of Chalkida, check in to our hotel, dinner and overnight. Early morning departure from Evia to Athens. We will have a look at Athens, named in honor of their patron saint - the favorite daughter of Zeus, goddess of wisdom Athena. City tour by bus, where our guide will show you the Parliament, the Tomb of the Unknown Soldier, the Presidential Palace and Kallimarmaro Stadium (Panathinaikon Stadium), where the first modern Olympic Games took place. Visit the fabulous Acropolis New Museum from where you can have a magnificent view of the Parthenon and Erectheum before viewing Athens a top Mars Hill where St. Paul stood and preached the truth to the Gentile nation. Visit also the Acropolis Parthenon and the Agora (ancient market place and centre of Athenian public life). A short walk through the narrow streets of the Old city, the famous Plaka with a multitude of shops and cafes. We will visit the Metropolis Cathedral, where the holy relics of Gregory V the Constantinople Patriarch are, and the small Kapnikarea church. Check in to the hotel. Dinner and overnight. 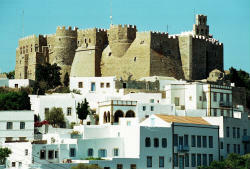 Around 02.00 AM early morning arrival in Patmos and transfer to your hotel for a few hours of relaxation. After breakfast visit the Monastery of Saint John the Theologian a Greek Orthodox monastery founded in 1088. Today UNESCO has declared it a World Heritage site. It is built on a spot venerated by both Catholics and Eastern Orthodoxes as the cave where St. John of Patmos had visions. John is considered to be exiled to Patmos, undergoing a time of persecution under Roman rule. Revelation 1:9 states: "I, John, both your brother and companion in tribulation... was on the island that is called Patmos for the word of God and for the testimony of Jesus Christ.” This grotto is believed to mark the spot where John of Patmos or John the Evangelist as widely known, received his visions that he recorded in the Book of Revelation. 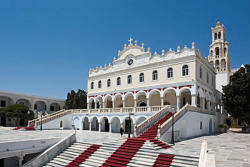 We will also visit the Monastery of Immaculate Mother Igapimenou. Evening we get the ferry-boat and overnightreturning to Piraeus port. Early morning we arrive in Piraeus port and we take our bus to Rafina port (aprox 50 minutes). We take the boat from Rafina port to the island of Tinos, the island of Virgin Mary. There, in the city center in a straight path from the port, worship at the church of Our Lady, where the shrine, called "Virgin Annunciation" is maintained. A beautiful image of the Virgin kneeling with head bowed in prayer, is regarded by scholars as the Byzantine period and may be the work of the Apostle and Evangelist Luke. It is thought that the picture was a sacred object in the Byzantine church and hid or lost in time from raids by Muslims. Shortly after the discovery of the image, the construction of a new church began. Numerous references to miracles of healing rapidly increased the reputation of the Church of Virgin Mary, so that today the Sacred Icon is the most revered shrine of the Greek nation. Check in to our hotel in Tinos, dinner and overnight. After our breakfast we leave from Lamia and we continue our trip to visit to the monasteries of Meteora. Here you will see the world famous Byzantine monasteries that are perched precariously on summits of grey rock pinnacles of varied and beautiful shapes. Their history goes back to the 14th century when the monks sought refuge in the cliffside caves then fled higher to build the original wooden shelters, later transformed into monasteries. 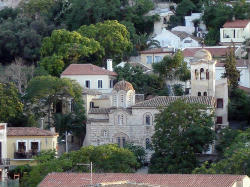 We will have the opportunity to visit the monasteries of St. Barbara, St. Stephen, St. Nicholas and St. Varlaam. We are leaving Meteora and after a short trip we arrive in Thessaloniki. Dinner and overnight. 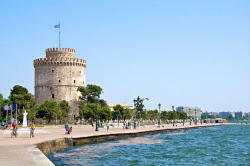 This morning after our breakfast we look at Thessaloniki, the Nymph of Thermaikos Gulf. We will visit the church of St. Dimitrios, the partron of the city, where we worship his holy relics. We can organize Divine Liturgy there upon your request. Right after we will get to know the most important Orthodox temples of Thessaloniki, starting with the church of St. Sophia which is one of the oldest in the city with its unique mosaics. We continue with the Rotonda – St. George, the catacomb church of St. John the Baptist, the church of St. Grigorios Palamas and the symbol of the city, the White Tower. Transfer to Thessaloniki airport Departure flight back home.